Inner Rambling of a Mid Life Mama. : Am I getting old or what????? I looked around me in the department store where I was shopping the other day and I was the only one under 80....surely THEY were in the wrong department??? I'm often told how cute my grandchild is.... when I'm out with hubby! I'm contemplating some Depends underwear for the boat rides when we're on vacation! it just makes sense to me now. 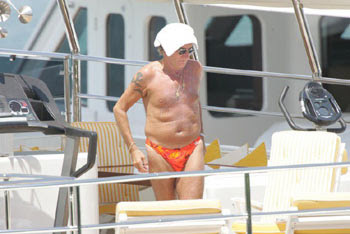 Rod Steward in a banana hammock still does it for me!!! com'on i know he does it for you too!!!!!!!! Your list resonates with me. I think I have a similar but different list, hmmm an idea for a blog post methinks. Spud..you win over Rod's wrinkles any day! Although it's going to be hard peeling that picture from over my bed!! Mari...you hit the nail on the head, we need to drink to it!!!! Cheers!!! And a word of comfort (well, it actually comforts me)...the whole list made me laugh because I recognize so much. You are not alone! So yes...let´s have a drink..I need one now. Maybe we can all go on a cruise and get drunk while playing bingo?